Create a majestic effect to your home with alluring stream of LED panel lights that casts a glowing illumination to the overall area. The possibilities of decoration are endless when it comes to glorious LED’s as you can strategically decide on the best area; install it with multifarious lighting fixtures and highlight the ceiling with statement lighting. Hidden lighting is the best way to add some mystery and drama around the space. As it is concealed, showcase the cove area with a warm blend of strip panel LED for an unmatched unique element. Moreover, it comes with a range of colorful hues to give a mix and match effect, or to get a gentle glow always opt for warm and cool tones to lend a minimalistic effect. The light setting for living rooms should always be inviting, rather than overpowering it with several lighting source keep it basic and understated. Simply make the area a little artistic, add some visually appealing artworks, textured wall decor and accent pieces and adorn the overall pieces with LED panel lights. Lighting scheme for kitchen should effectively highlight the best work area with pendant fixtures; along with it panel lighting is the best way to recreate an atmospheric zone. 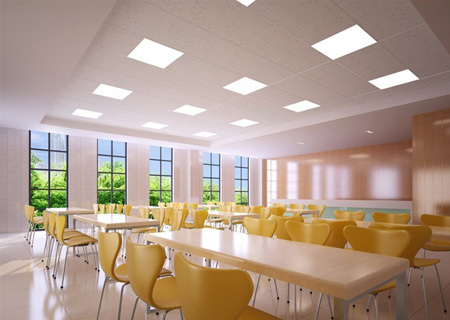 Whatever you are upto, stunning and multi-functional lights significantly increases the work condition to a great extent. Versatility is a key factor in uplifting the decor zone of the entryway! From subtle to brightening glow, there are umpteen ways you can decorate the area with proper lighting. Effervescent cluster strips suspended in the ceiling gives a floating feel whereas a series of panel lights enhanced with dimmer switch brings out a dreamy ambience. Bathroom lighting demands a chic and contemporary solutions and what better than LED lights to glorify each and every corner. The vanity area and the mirror is the most eye-catching element, so to give them a striking glow, overhead lighting in warm tone can have a massive impact on the surroundings. Additionally, this energy efficient lighting not only gives a splendid view to the interior, but is also used extensively for cabinetry and shelves to manifold their impact. It is suspended to specific places creating a pool of light to the inside zone. Furthermore, the lighting complements the decorative accents and ensures a whole new dimension of brilliant luminance. By incorporating LED lights in desired interior spaces, you can give a classy and contemporary appearance to the entire area. And enliven the ambience with a combination of artsy, vibrant and abstract decor detailing to make a definitive statement.